Generations of fans can testify just how difficult it used to be to find women who had any interest at all in Captain Beefheart’s music. Captain Beefheart always said that his music was for women, but not until recently did this message seem to be getting through. The Magic Band reunion concerts were notable for the number of women who attended and demonstrably appreciated the music. 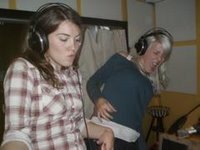 Now, in Trondheim in Norway, two hard rocking female students are hosting a weekly radio show called Ella Guru. Captain Beefheart’s Ella Guru is their theme tune. Thea Aarbakke and Sara E. Grønvold are Ella Guru’s DJs. Sara (to the right of the photograph) and Thea agreed to tell me about their programme. I asked first why they chose the title Ella Guru. In Ella Guru we talk about, and play music, on different subjects every show. Therefore we first thought of the name Guru, hence our position as “teachers” during the show. It was actually my father tipping us about the name Ella Guru. We really liked the idea, both because we like Captain Beefheart, but also because “Ella” gives the name a hint of femininity, and we are both females. We feel that the name describes our radio program, because we are two female DJs who mostly play rock ‘n roll music. Do all Norwegian DJs play a Captain Beefheart track nearly every week? I’m thinking of Harald Are Lund who has included a Beefheart track on his show on nrk p3 every Thursday night since the channel started up in 1993. The answer here is no. You/we wish! We don’t know of any other DJs than Harald Are Lund and us. What is it about Captain Beefheart’s music which appeals to you? What appeals to us in Captain Beefheart’s music is the madness at the same time as he shows that he is a genius when it comes to making music. He is original and above all real! A lot of other musicians use craziness as a part of a commercial way of thinking, but as audience you can feel that it’s fake. This is not the way Captain Beefheart makes you feel. Ella Guru is a great song from one of the greatest avant-garde records ever. Captain Beefheart’s music traditionally appealed to male listeners. It was rare in the seventies for women to enjoy it or to go to the concerts. When The Magic Band performed again recently it was noticed by most of us “old farts” that there were a lot of young women at the concerts who were enjoying the music and even dancing to it. What could it be about this new generation of women, or what is it about the music itself, which causes this? Make up your own question and answer it here. Do we think that more people should listen to and discover Captain Beefheart? YES! Ella Guru broadcasts from Studentradion i Trondheim (FM 107,0 – FM 104.2 – FM 102.1) on Saturdays from 19.00 to 20.00, and is repeated on Fridays at 21.00. The most recent broadcast of Ella Guru is streamed from this webpage (scroll down the column headed Fredag to 21:03:00 and click on the (R) ). More information, including previous Ella Guru playlists, can be found here. Graham Johnston’s essay Gender and the Avant Garde includes an investigation into Captain Beefheart’s attempt to attract women into his audience.